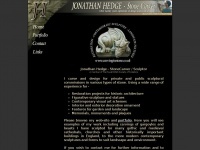 Jonathan Hedge - Stone Carver. Restoration, contemporary sculpture, design and landscape features in stone. The web server with the IP-address 109.108.143.46 used by Carvinginstone.co.uk is run by UKfastnet Ltd and is located in Great Britain. This web server runs a few other websites, mostly in the english language. The websites of Carvinginstone.co.uk are served by a Apache server. The website does not specify details about the inclusion of its content in search engines. For this reason the content will be included by search engines.